Come what may, you can’t visit Nepal without trying Nepal’s ubiquitous dal bhat. Ask any trekker if they’ve tried it, and they’ll roll their eyes and give you a look of disgust. This is not to say dal bhat is not gastronomically pleasing; it is simply the monotony of this Nepali staple that causes such disdain from travellers. 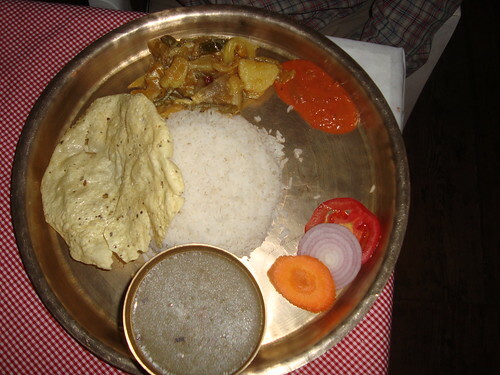 Nepalis eat two meals a day, one mid-morning and the other in the evening. And guess what they both are? Yep – dal bhat. Every day of every week of every month of every year, Nepalis eat dal bhat. This might be the reason you don’t see Nepali restaurants in Western states – the menu would be very, very terse. Dal bhat consists of steamed rice and lentil soup, typically served on a tin tray. It is often served with a vegetable tarkari – a vegetable curry with spices similar to those of Indian cuisine – and unleavened bread such as a roti or chapati. A small portion of chutney or pickle (called achar) is usually included, as well. I will say this for dal bhat – it is the perfect trekking meal. It provides plenty of much-needed carbs and protein. Although often boring to the taste, it offers a great deal of sustenance and energy for your next day of hiking. Marathoners should take note.